The adorable Whale featured on this blanket is sure to keep your little one happy! 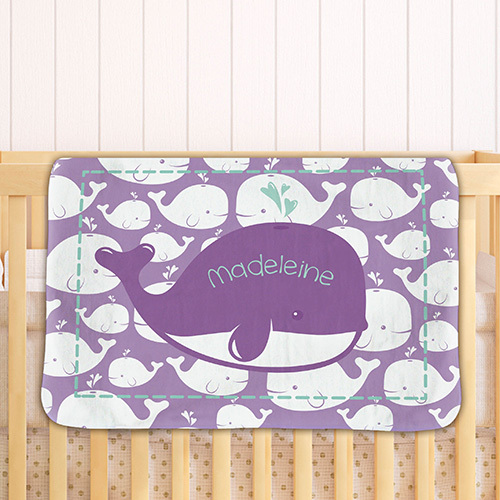 For these Personalized Baby Gifts, choose either our Gray or Purple design color and customize this blanket with any name to create a wonderful personalized baby gift that your little one is sure to enjoy! I ordered this blanket for new great-grandson. The design and print was excellent, however, I was initially disappointed in the weight of the blanket. I had expected a heavier fleece. This blanket is very light with a silkiness to the fabric..therefore it is soft. The mother and grandmother loved the blanket and we all felt it will be the ideal weight for spring or summer evenings, especially since they are a beach-loving family!!! So all-in-all, I am very pleased with the purchase and I would recommend if you are looking for a very cute but light covering. Service and shipping was great also. Additional Details Be sure to check out this other super soft fleece blanket if you are looking for an adorable personalized baby gift idea.